While I like to pretend that I blog without obligation the reality is that I feel terribly neglectful when I haven’t posted in a while, the neglectful feeling leads to guilt, which then leads to despair and I become overwhelmed and no longer know where to start. Silly isn’t it? Perhaps you suffer from the same affliction. Rather than sit here overwhelmed I’ve decided the best thing to do is just start posting again. Who cares if some of my photos were taken over a month ago, I certainly don’t care when other bloggers take a month to blog about their creations, I just like that they’ve shared. You may have already seen snippets of what I’ve been up to on various social media platforms and for lots of people that’s enough, but if you’re like me then you appreciate a blog post, something that talks about the pattern, the materials, the process. My lovely friend Jen is moving to the UK at the end of the month. We had a lovely afternoon tea to celebrate her birthday and say goodbye last weekend and I wanted to give her something she could take with her. I’ve been pondering designs for felt embroideries for some time now (expect to see more!) and thought ‘fly’ was very appropriate for someone going to live her dreams. I wish her all the best on her big adventure. PS. I’ve started to watermark all my images with my logo. Slight ‘discolourations’ are due to the opaque logo, not the work itself. that is really lovely – jen will treasure it. I saw the link and thought “Kite embroidery” ? 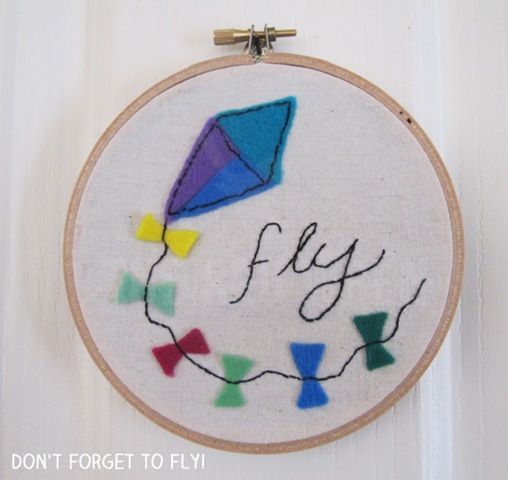 Why would you embroider a kite? Wouldn’t that effect how it flies? I love it and it is coming with me!